There must be SOME communication in order to teach language. Teaching must begin with communication. But what kind of communication? I cannot ask for output. I cannot ask a question. The teacher must choose the course of action with the fewest obstacles and build from there. Based on that, the order should be: 1) explain or demonstrate meaning, 2) give instruction, 3) request output, 4) ask a question. The teacher will demonstrate and name actions. The problem with this approach is that the teacher could very well show and name every animal, every vegetable, every person, and demonstrate a multitude of physical actions without knowing whether or not the student is comprehending. Likewise, since the student is doing no work to engage, he or she may simply be a spectator observing the spectacle that the teacher is putting on. Because of these concerns, the teacher will want to quickly incorporate the next task of giving instruction (while continuing to employ the first) to encourage active learning and to gauge understanding. A thoughtful teacher will be thinking ahead to this step while physically explaining meaning in the above step. She will choose to teach verbs representing actions that the student can carry out immediately in the current setting. Actions like, “sit,” “stand up,” “jump,” and “clap” are convenient favorites. The teacher encourages the student to perform the actions along with her as she gives the command form for them. Bridging the gap from one task the next can be difficult. Demonstrating “stand up” is quite easy. Having the student do it with you can be more challenging. However, teachers usually hit a bit of fortune here if they are very good at encouraging the student with gestures (hands: “come on”, pointing “you” and then the action. For most students, these actions will communicate for them to join in. Many at first will only partly or half heartedly join in. The teacher must immediately enthusiastically confirm that theirs is the correct response in order to communicate, “yes, this is what I wanted.” Nodding and exaggerated smiles usually get the point across. Students are ready at different times to begin speaking. Some need more time than others, and generally should not be forced to speak until ready, although gentle encouragement is a good idea. When a student is ready to begin speaking, there is an order in the types of output you can expect. There are generally three types of output. A student will not be able to jump immediately into dialogue with a student. Best practice is to at first just get the student saying something, anything. Repetition at the first stage in the process is viable. There is some disagreement among teaching methods about rote repetition and its role. More specifically, there is some question about whether the student should be repeating single words or placing them into sentences at this point. Many schools go ahead and have their students use full sentences from the start. The thinking behind this is that words are rarely used by themselves in a real life situation; they are always used in context. However, having a student repeat an entire sentence can confound the student’s understanding of the word in isolation. For example, if “apple” was taught in the above section, jumping to “I have an apple” for the student’s first utterance can be beyond their comprehension. The student may as easily think that “I have” means “apple” for a time. While some schools disagree, it is beneficial to ask ourselves whether it is important that the student understand all they speak at this stage. It is the opinion of the author that the student should understand his or her utterances. ( I certainly do not go about repeating sentences given to me which I do not understand. Why should my students?) If at all possible, the rote repetition should extend only to concepts that have been fully taught before moving on. This way, when the student moves to output type 2, meaningful utterances (or full sentences) the utterances are actually also meaningful and resonant for the student. Proceeding with the author’s preference, the step of repetition should incorporate the stand alone words demonstrated in the above steps. The student can repeat “apple” with the teacher when an apple is shown. The student can say “jump” along with the teacher’s commands. Some students may naturally say the words along with the teacher from the very beginning, naturally bridging the steps. Others will need to be encouraged to move on to the step of repetition. The simplest meaningful utterance that can be elicited from the student is a command. Commands can be one word or phrasal verb, and are already familiar to the student because they were used in previous steps. So, this step should include the student choosing which commands he or she wants to give. The expressions are meaningful because they are chosen, and elicit a reaction (from the teacher who obeys the command). This step will take the longest to achieve, and frankly, many methods and schools rush this step a bit. The first two types of utterance can be achieved very quickly. In fact, it is often possible for a teacher to guide a student through all the tasks (explain meaning, give instruction, and rote repetition) in a single session. Some students will even take initiative to do all three simultaneously with minimal effort from the teacher. However, moving from these three steps that involve simple cognition, to the much more complex idea of exchanging ideas verbally, is a huge leap. Using a prop, I intentionally misplace an item or complete a task wrong. This could be anything from adding 2+2=5 (on a whiteboard, not spoken) or placing Mr. Potato Head’s arm in the hole where his nose would be. Most students cannot just sit by and watch the Teacher make a mistake like that. Many will jump in with gestures if they don’t know how to say “no, teacher.” Then, you can teach them “no, teacher” and make the signs for them to repeat. And there you have your first meaningful utterance. The student expressed his or her own idea. This is a big step and should be celebrated enormously. Just because a student can express ideas doesn’t mean he or she is ready for question and answer. Often, students will not recognize a teacher’s words as interrogative. Additionally, answering questions involves real life, real time skills and an ability to process two sides of a conversation in their target language. When a student is ready the above technique used to begin dialogue can be employed. After colors and “have” are taught, the teacher could say “I have a blue shirt” while clearly wearing, not blue, but the color the student has on. The student will contradict the teacher. The teacher can then say “who has a blue shirt?” while pretending to notice the student’s shirt. The student will notice too, and to answer, will need to repeat the phrase the teacher already modelled, “I have a blue shirt.” For me, using these methods for dialogue are much more meaningful than rote repetition. As I said earlier, I prefer to save rote repetition for stand alone words and ideas at the beginning of a concept cycle. For each concept covered, the teacher progresses through each task in the concept cycle. It is not intended that the teacher exhaust the explanation task before moving on to giving instruction, etc. Likewise, it is not recommended that a teacher move through all of the tasks for one concept, never to return to complete the cycle. Rather, it is recommended that the teacher revisit the concept cycle for each new concept covered, at least until the student is proficient enough in the target language to understand explicit instruction in meanings, grammar, tenses, etc. For native English speakers, it can be difficult to really experience the language as a learner would. Something about our close proximity and familiarity, coupled with our tendency to generalize and simplify, can mute the distinct nuances of the language to the point that the native speaker doesn’t even recognize them. English is full of complex patterns and ideas, contradictions and rules far beyond what most native speakers can experience “up close.” You may have experienced this when an English learner asks about a contradiction or a rule that you’ve never thought about. It can throw us or take us a moment to unravel what we thought we knew about the language, but had blanketed over in our extreme familiarity with it. To illustrate this tendency, I will draw on a metaphor that works for me. What color should Lucy paint her white cat? Let’s imagine that Lucy wants to paint a picture of her white cat, Henry. She is a person with no artistic background. She is very familiar with her cat and knows exactly what he looks like--every inch of him. After all, they have lived together for eight years. 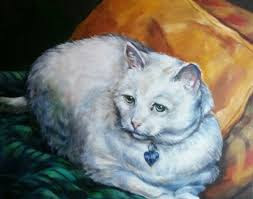 Lucy figures that her white cat is an uncomplicated subject and knowing Henry as she does, she should be able to paint him relatively easily. She goes to the hobby store and buys a canvas, brushes, and white paint, for the fur of course, as well as some green and gold for the background. She draws the shape of the cat onto the canvas and begins to fill in the fur with precise brush strokes that imitate the fur of her faithful cat. She is careful to paint the fur longer around the neck, and to recreate those little folds of skin and fur with careful touches of the brush. Around the cat’s haunches she contours, following the lines of the body perfectly. She steps back to take a look. The painting doesn’t look anything like Henry. It looks more like a blob of white. She examines her work carefully, checking to make sure she has every angle, every detail formed correctly. It was all right. And yet so wrong. Lucy doesn’t want to give up. She takes art lessons. In one class, the students paint an egg. She reaches for the white paint, but the Instructor encourages her to step back and really see the egg. “What colors do you see?” the teacher asks. “White,” responds Lucy. Obviously the egg is white. “Yes, the egg is white,” replies the kind instructor, “but what color do you see?” Lucy looked long and hard at the egg, tracing with her eyes the contour of the egg from its pristine white peak along the sloping edge where white turned to ecru, amber, and gray. Lucy caught her breath. Her eyes darted to the other side of the egg, while still in reality white, she saw pink, blue, and lavender. There was very little white visible on the egg she knew to be white. The instructor nodded. “You have to be able to see the egg before you can paint it.” Lucy understood. It was not enough to know the color of the egg. She had to know how the egg was perceived. Lucy went home and took a long look at her cat. While her mind still knew he was white, her eyes were open to see what she would need to in order to paint him. Green and gold reflected off the pillows, grays in the shadows of his fur. She noticed that to paint the white cat, she would even use black paint! The closer she looked, the more variation she found. She laughed at herself for thinking one could paint a white cat with white paint. Just as it wasn't enough to simply know that Henry is a white cat, to teach English, it is not enough to know the elements that we speak of. It is not enough to understand parts and place a label on them. We must be able to know the language as it is perceived. Our familiarity with the language can blind us to the differences and contradictions in our mother tongue. If we cannot see these details, we cannot teach them, any more than Lucy could paint her cat when she only perceived him as the white she knew he was. Our labeling and categories can impede our progress. If someone asks what sound the letter “t” makes, native speakers might have just one answer. However, if a teacher takes time to step back, forget what she knows about the letter t, and experience it, she will hear that there can be differences in the sounds. This can be difficult to do. As a teacher attempts to test the theory, he or she may articulate more than usual, throwing off the result. Putting much effort into hearing the differences can make the teacher very conscious, which can also make it difficult to hear new things. Want to step back and see the colors? Some things to look for are differences in aspiration between an initial “t’ in teacher and the final “t” in night. Is the “t” in certainly almost skipped over by some speakers? By yourself? Do any of the “t”s sound like “d”s? Do any of the “d”s sound like “t”s? Many language learners are experts at noticing these differences. Partly due to their own linguistic backgrounds, there are some letter sounds that will pop out as entirely distinct to their ears--sounds that we lump into one category (as in the “t” example above). Other experiences in their own language make them deaf to sound differences in their language, just as we are in ours. Since language learners are likely to pick up on contradictions and variations, it is good for us to be aware of them, or at least able to stand back when we need to and take a good hard look or listen to see if we can experience their conundrum, just as Lucy had to step back, throw off her preconception that eggs are white, and see what the instructor was seeing. This ability is what makes the difference between a good English teacher, and a good English teacher for English learners. Learners need a teacher who can experience the language as they do, so that they can help them solve the frustrating problems and contradictions that they can’t get past themselves. In this blog, I will give more insight into the mind of the language learner. With time and practice, any teacher can improve his or her ability to step back and see all the colors of English. VIPKID is a dream come true for me! Is it right for you? Confession: I’m a full-on VIPKID sell out. Now on my third contract, I’m one of those teachers who obsesses about the color orange (the company’s “team” color), and talks about my students to the point that my family knows them all by name. I’m one of the ones who participates in all of the incentives and contests, and who lost her ever-loving mind when she finally got an orange VIPKID hoodie. I could go on to explain the way the company has turned my life on its head in an amazing way--but you will understand when you get on board, if you find that this job is right for you. See, since I started working for VIPKID, I have been in contact with hundreds of teachers who are amazed that they have found such an opportunity. They love the freedom to work at home, set their own hours, be their own boss and build a business for themselves. Like me, they love being in charge of their own destiny, free of any office politics or climbing ladders. But I have also seen some teachers who have a harder time adapting. I started paying attention to what they were saying about their experience and comparing it to my own. What I found, is that it all boils down to expectations. Some of the teachers had expectations for VIPKID to treat them as employees, while others understood what it meant to be an independent contractor. It makes all the difference to understand the role and evaluate whether it works for you. To be a successful online teacher, independence is crucial. A VIPKID teacher sets his or her own hours and is entirely responsible for being in class on time and prepared to teach. Since you are working from home, there is no other person between you and your student. For me, this idea is liberating. For others, who like a support team, it can be frustrating. It’s worth considering, before applying, whether you enjoy finding what you need within yourself, or whether you prefer to work for a company as an employee with a built-in support system. VIPKID teachers have to be prepared to do the job. As solo artists, no one else will make sure anything is ready for you. It is entirely up to you how prepared you will be, both to teach, and to handle IT glitches, discipline problems, special ed concerns and difficult concepts. What will you do to explain that grammar piece to a non-native speaker who is waiting on the other side of the screen? Do you need to brush up on a subject before entering the class? Do you have backup plan for when your wifi goes out? Do you need some new props, tools, or materials? It’s all up to you! You get paid for completing the class. But if you are unable to, even for good reason, you don’t get paid. It’s entirely up to the teacher to make sure that class goes off without a hitch and that the material is taught well. Online teachers have to solve their own problems. VIPKID, for example, is in China. They are up and working during class time when their customers are awake. By the time you finish your last class, they are in bed and cannot get to your urgent email till the next morning. For me, this means that most often, I need to be able to solve my own problems. I need to have the skills of scanning forums and interacting with other teachers to find solutions and answers. I may have to “wing it” with a solution that I come up with at the moment and be confident that I am making the right call on what to do in a difficult situation. It’s a great idea to ask yourself if you like solving problems yourself or if you’d rather work in an environment structured to help in that area. To work remotely as an independent contractor, I’ve found that I need to be confident of myself and my performance when I don’t get validation from the company. Unlike a traditional employer/employee relationship, I don’t receive annual reviews, constructive criticism, or pats on the back for a job well done. If a teacher is not prepared for this, he or she may feel isolated and unvalidated. The truth is, as independent contractors, our job is to show up and do our work. We will hear from the company if anything needs to be changed. If all goes well, however, we can go an indefinite amount of time with no direct feedback from the company about our performance. If I’m of the mindset that I must hear from the company whether or not I am doing well, I’ll drive myself crazy. Some introspection can help you discover as well, whether you would be able to function well in an environment that demands you get your validation from within. Will you enjoy managing yourself? Many of us have found that we enjoy independence, making our own calls, and not worrying about reviews, micro-managers, and office politics. These are the payoffs for being independent, prepared, resourceful, and confident. Do you have what it takes? Please watch my video review of working for VIPKID where I go in more depth about the pros and cons, and what it’s like to be an independent contractor for an online company. If you use it to apply, I’d be happy to answer any questions for you that I can. You can shoot me an email at therealhopewilliams@gmail.com.